Spring is in the air and a girl’s heart turns towards wild edibles. Or at least this girl’s does. I love foraging. It’s basically a combination of hiking and a game of where’s Waldo with a tasty snack at the end. Back in the spring of 1920, Mary Bentley was foraging too only, instead of eating her finds, she put them in an herbarium atlas. Each page features a plant found in the county along with its name and the exact date and location where it was picked. Some of the of the plants in the book include meadow rue, crinkle root, and several types of violets. Several of them are edible and quite tasty including strawberries, blueberries, and those violets I mentioned. Others are deadly poisons. Bentley’s herbarium atlas is a great tool for studying the way our local ecology has changed. Right now, the banks of the Chemung River are overrun with Japanese knotweed (Reynoutria japonica). Best harvested while it’s less than five inches tall, knotweed stems are a tasty rhubarb substitute, but they don’t belong here. Knotweed is an invasive species brought to America as a landscaping ornamental in the late 19th century. Other invasive edibles by the found in abundance by the river include garlic mustard (Alliaria petiolate) and white clover (Trifolium repens). There are no invasive species in Mary Bentley’s herbarium atlas. Everything in its pages are native to North America. Some of them I recognize. 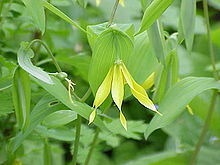 I’ve seen bellwort (Uvularia perfoliata) growing all over the place. Others I’ve never seen before. Am I just looking in the wrong place, or have they simply been out competed by their invasive rivals? Either way, it’s clear that the plants along the banks of the Chemung River aren’t what they used to be. A quick note about wild edibles: foraging is a dangerous hobby. People have died from eating the wrong plants and even some nominally safe ones can have negative interactions with prescription medications. I have several references I use when I go out gathering, I always follow the harvesting and preparation guide, and I never eat something unless I am absolutely positive I know what it is. If you’d like to get into foraging, please, do your homework and stay safe.